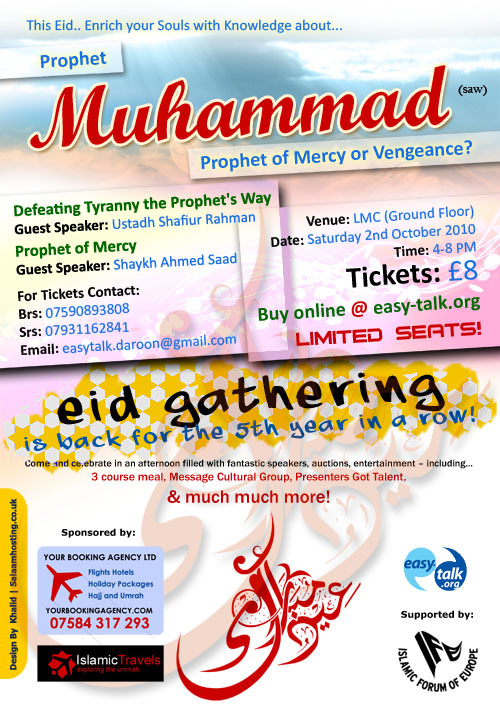 Eid Gathering: Prophet of Mercy or Vengeance? Easy-Talk's annual Eid Gathering you dont want to miss out! Come along and celebrate an afternoon filled with fantastic speakers, auctions and entertainment! This Eid enrich your souls with knowledge about our beloved Prophet Muhammad (peace be upon him), was he a prophet of Mercy or a prophet of vengeance? 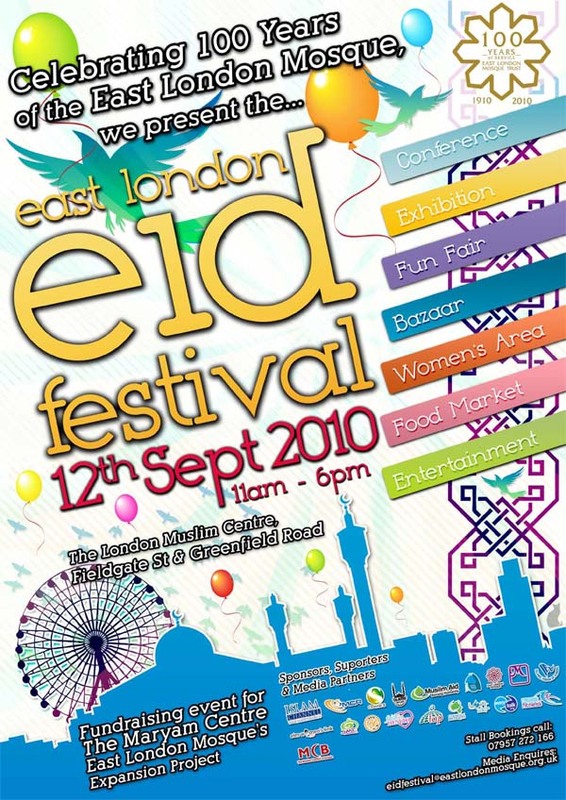 The East London Mosque invites you to the East London Eid Festival. This is a event that marks the start of the Mosque's 100 year celebrations.The grand opening of the Eid Festival will take place at 11am with special guests. Wander through the bazaar and try haggling yourself a bargain on Islamic arts and crafts, perfumes, books to a variety of fashion accessories - all on one street! All this will merge around numerous challenging activities. If you dare, abseil from the roof of LMC or ‘dunk' one of your community figures in freezing cold water. How good is your shot? The Helter Skelter, planes, trains and auto-mobiles are amongst some of the fun fair rides that twirl, twist and wobble. From the top of the Ferris Wheel you'll not only be able to see above and over ‘Phase 2' extension but moreover glimpse the horizon. Not for the faint hearted! Why not indulge your taste buds with luscious food from distant lands. Delicious biryani, burgers, cakes and shakes, Ramadan will be over, so eat as much as you can! Walk through the 100 years exhibition of the East London Mosque with Khan Shaab, Haji Taslim Ali, Marmaduke Pickthall and the likes of the Begum of Bhopal. Visit the women's area, paint your hands with henna or learn to arrange a flower bouquet whilst the young ones take their chance in the lucky dip! All this without missing a prayer, the East London Mosque will also be the location hosting a series of lectures in Bangla, English and Somali. MCR will be live on the airwaves and broadcasting at the Eid Festival. Hosted by your favourite MCR presenters; a roaming microphone will be around and everyone can catch up on the latest event news and fundraising updates. Sunday 12th September 2010 11am - 6pm! Easy-Talk presents as part of it’s…. Eid Gathering 2009 - All Welcome! Easy Talk's Pledge Day - Helping Gaza, Donate Today!